U.S. Asian policy today is a curious blend of seemingly firm bilateral commitments and occasionally startling ambiguities. The latter, while preserving American flexibility, run the risk of signaling weakness when friends and potential adversaries probe for clarity of purpose. This American "inscrutability" in Asia is all the more troubling in a region lacking a strong web of multilateral institutions, as exists across the North Atlantic. 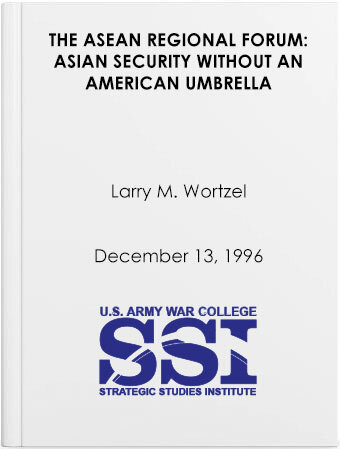 Indeed, if the United States is to maintain regional stability in Asia, Colonel Larry Wortzel, the U.S. Army attaché in Beijing, argues, it must make multilateral dialogues like the Association of Southeast Asian Nations Regional Forum a major tenet of its Asian policy. The problems that need to be addressed by the United States in conjunction with its Asian friends, allies and potential foes—proliferation of weapons of mass destruction, ethnic conflict, territorial issues, trade relations, and the future of democracy throughout the region—are every bit as important to U.S. security in the Asian context as they are in Europe, where they receive intensive, continuous, multilateral scrutiny. Colonel Wortzel calls our attention to the nascent ASEAN Regional Forum and causes us to consider its potential to enable a highly diverse group of nations to enhance their mutual understanding, stability, and security as they enter the 21st century.